The journal posts the final published version of the NIH-funded article to PubMed Central (PMC) without author involvement. 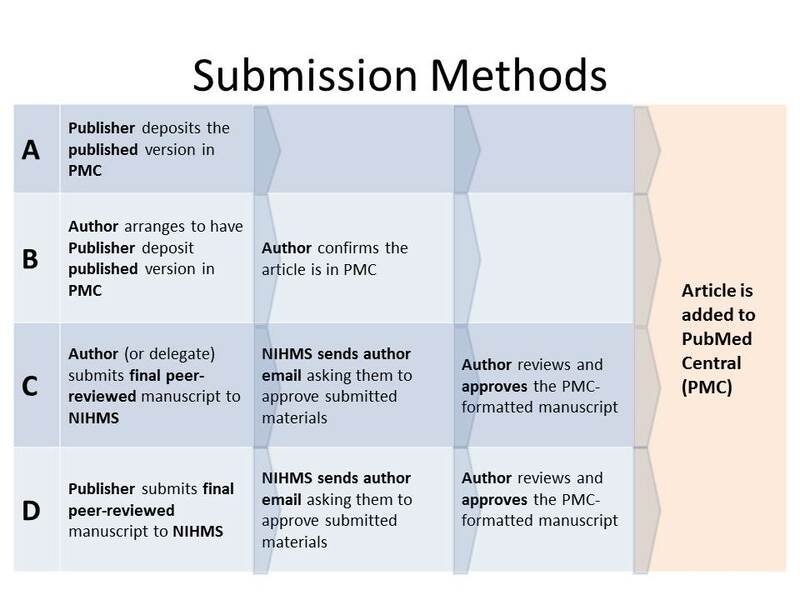 The author makes arrangements with the publisher to post NIH funded paper to PMC. This usually involves choosing the publisher's fee-based open access option. The author or PI or a delegate deposits the final peer-reviewed manuscript in the NIH Manuscript Submission system (NIHMS). The author or PI is responsible for completing approval steps and ensuring that the final peer-reviewed manuscript is deposited in the NIHMS. The publisher deposits the final peer-reviewed manuscript into the NIHMS. The author or awardee is responsible for completing approval steps and ensuring that the final peer-reviewed manuscript is deposited in the NIHMS. More information about these four submission methods is available. Diagram courtesy of Duke Medical Center Library and Archives.